…aka mashed plantains stuffed with slightly sweetened black bean paste, deep fried until caramelized and satisfyingly crunchy. The jury is out on when you’re supposed to eat this delicacy–I was served it at dinner with scrambled eggs and black beans, but felt it may be more appropriate for dessert. However when the opportunity presented itself to take a cooking class last Friday, I jumped at the chance! Turns out “cooking class” was a subtle ploy to have students help make the traditional dinner we were to be served that night at the weekly graduation festivities, but I jumped on board just the same. The above-mentioned rellenitos were a great hands-on, tactile project. I definitely recommend making these with kids—you treat the plantains like play-do! 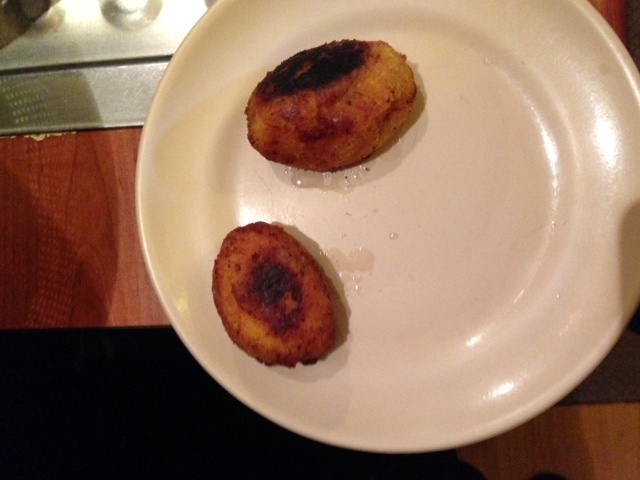 All four of us attending the “class” certainly took some frustrations out on these fried pillows of plantain-goodness. There isn’t much of a recipe for these love bundles, so feel free to adapt as you see fit. Please forgive this bare bones recipes. It is not sophisticated (and in fact I use the word “mush”), but it combines two important Guatemalan staples and is worth the effort. The first batch of the little buggers… this is me patiently waiting the requisite minute so I don’t completely burn my face off. 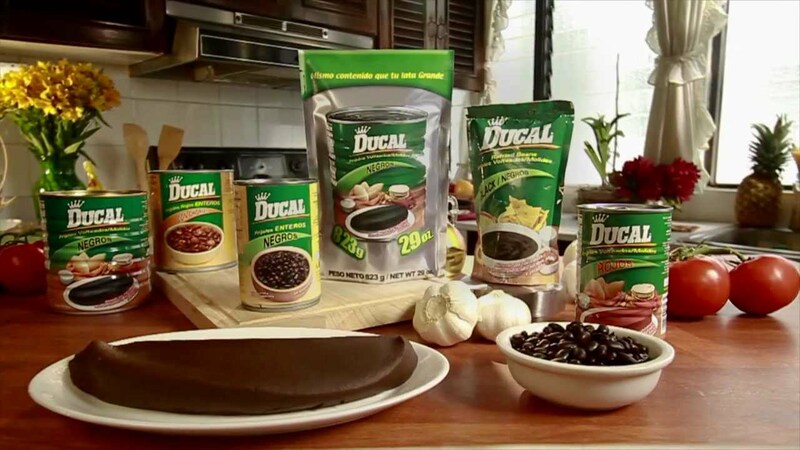 Note: Guatemalans are super into pre-cooked refried black beans. You can get them at every grocery store and cornerside tienda in an astonishing variety of package shapes and cooking-methods (boil in a bag! microwave! grill!). The consistency is very paste-like — I believe the beans have already been cooked with spices and oil and then blended. I’d try this recipe with refried beans out of a can, or make your own bean mush with a some cooked black beans, savory spices, and a blender. You don’t need so much for the recipe though, so make sure you choose something where you can use the leftovers. Additional Note: In the spirit of “seize the day” and trying to soak in my Guatemalan environment, these photos are unedited and straight from my phone. Apologies to anyone who may be offended by this. Just a smattering of the pre-cooked bean options available at your local Guatemalan supermarket… Mmm mmm, look at those silky black beauties. Peel plantains and boil in a big vat of water. 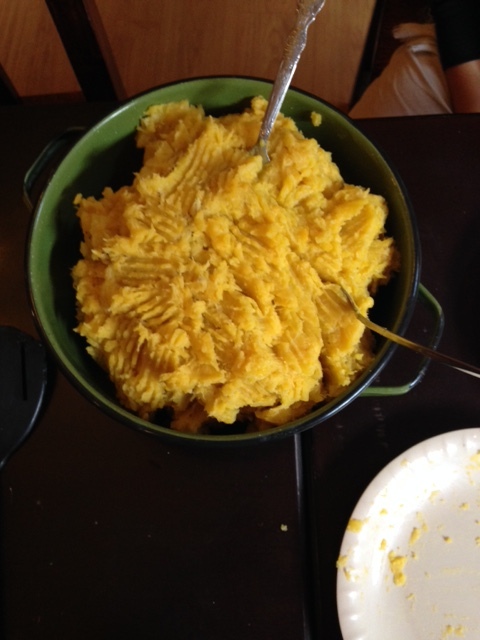 When they’re very soft, scoop out with a slotted spoon onto plates. 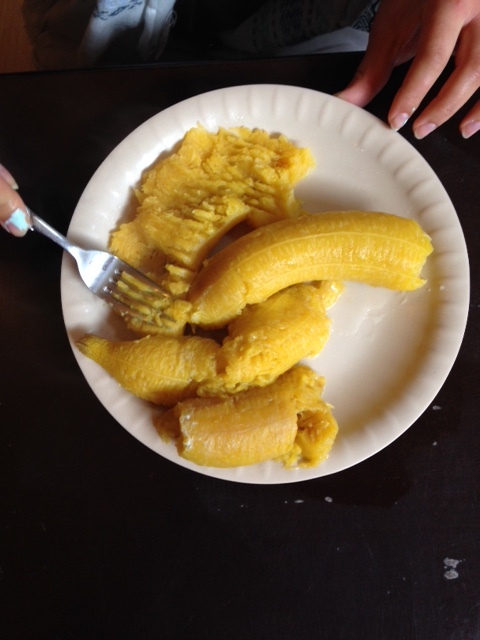 Use forks to mash the plantains into a paste like consistency. Set aside. Place bean mush in a bowl. Add cinnamon and sugar to taste. You want a slightly sweet final product, not an approximation of Asian-style red bean paste. For the giant vat of plantains we used, we probably added about 1 t cinnamon and a bit more sugar. Taste as you go. 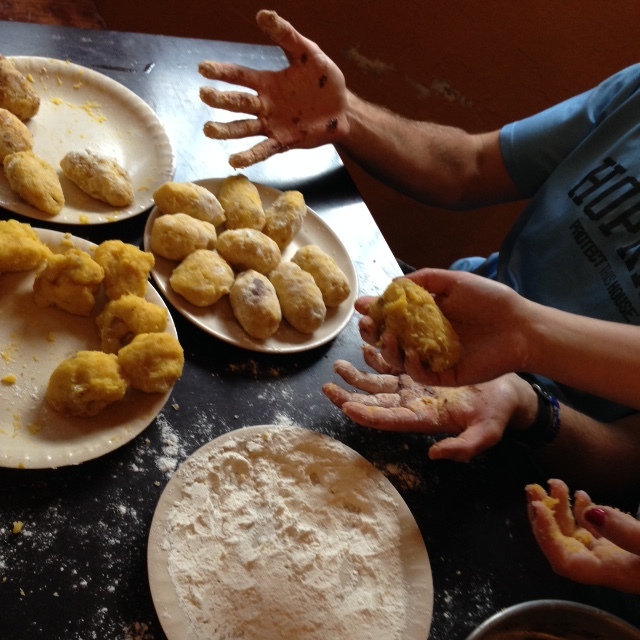 Take a small handful of plantain “dough” and flatten it into a patty or pancake a bit bigger than the palm of your hand. The patty should be about a centimeter thick, maybe a bit less. Scoop 1/2 tablespoon or so of bean mixture into the center of plantain patty. Fold sides up and around bean paste and fold ends in, forming a cylinder-esque bundle about two inches long. 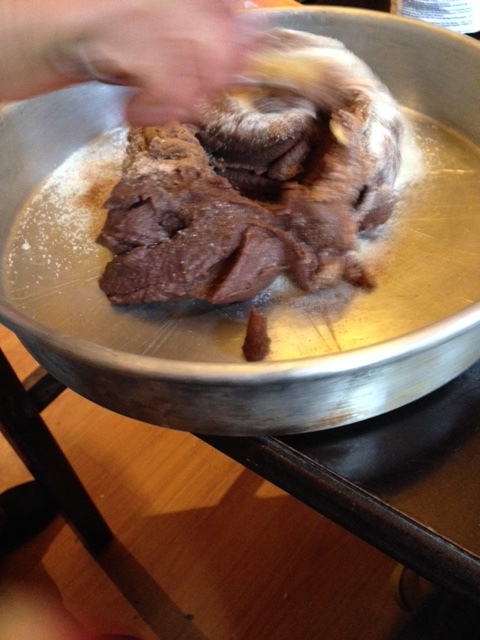 Coat generously in flour by rolling on a plate with a shallow layer of flour and using your hands to pat it gently in. Wash your hands throughout the process as necessary. In a deep frying pan, bring about a half-inch of oil to a simmer. 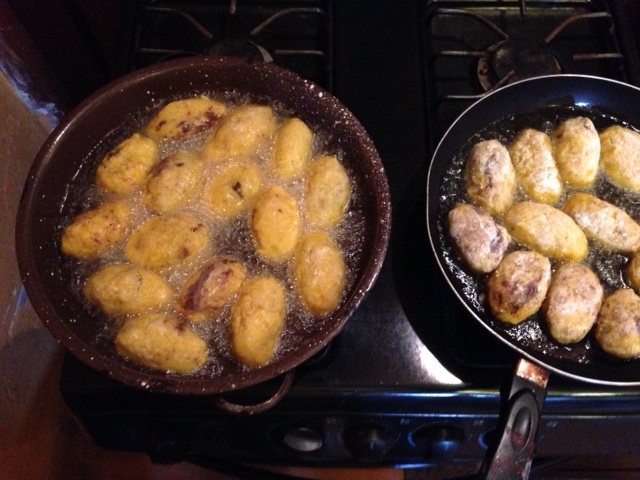 Gently add rellenitos and fry until golden brown. Don’t overcrowd the pan. I would try about 10 minutes per side. Drain on paper towels. I ate these as part of a dinner, but if you want them for dessert, sprinkle with powdered sugar. Serve warm. From yesterday’s hike up Volcan Santa Maria. We started climbing in the dark at 1 am and made it to the top (above the clouds!) for a chilly and incredible sunrise.